People often ask about what kind of racket that is used by a world class badminton players? What racket does Chen Long use? What is the brand of Lee Chong Wei racket? Many people eventually trapped with brand that pinned to those world players. People tend to think that whatever racket that is used by world top rank players will be the best racket for them. Well, the assumption is most likely wrong. Don’t measure others according to your own yardstick. Each people has its own style of badminton play. Each has different style of stroke. Nowadays, badminton rackets are designed to meet a variety of styles. Hence, the assumption of Peter Gade’s best racket must be the best racket of any player is not necessarily correct. Prior to looking for the best racket, you have to know which style of player do you like or want to be : fast and aggressive player, deceptive stroke players or straightforward and defensive player. Regarding to those player styles, badminton rackets can be grouped into power racket and control racket. It is not possible to have both power and control in one racket. For instance, if you are an aggressive player, definitely you have to use power racket. However, you can choose to have a balance of both. Note : I have summarized the racket specifications below in a printable form which you can download here. You may print it as many as you want. I only ask for your favor to share this article through the download link. Badminton racket has several weight type which is coded by letter U. There are 5 types of U, which are 1U, 2U, 3U, 4U, and 5U. Please notice that 1U is the heaviest and 5U is the lightest. Generally, a badminton racket weighs between 83-100 gram. Commonly, racket weight sold in market is 3U (85-89 gr) or 2U (90-94 gr) while other sizes are rarely sold, if any, such as 4U or 5U, is sold with fairly expensive price. The racket weight measurement does not include the weight of grip and string. If grip and string are installed at a racket, the total weight will be increased around 2-6 gram. In Japan, grip size is coded by G2, G3, G4, and G5 where G2 is the thickest and G5 is the thinnest. Talking about grip, you may need to decide whether or not it will be wrapped by a new one because it will make the racket heavier. Heavy racket is called power racket. This kind of badminton racket is best used by a player with strong wrist. Power racket will give more momentum when you swing your racket, especially when you play smash. However, the problem with such racket is that it’s not easy to control. You need to be patient and calm. The control of power is absolutely necessary otherwise your shuttlecock will be out of the line and it’s hard to hold a heavy racket too. On contrary, the light racket is good for controlling shuttlecock but is not good to get power. It requires extra strength to produce great power. 2. Try to find balance point of the racket. 3. If the racket is already in its balance position, note where your finger is. If your finger is closer to the racket head then the racket is power racket. But if your finger is closer to grip, then the racket is control racket. What if you have already bought a racket but it doesn’t meet your style? Well, there are several ways that you can do to fix it. For example : if you want your racket to be more controllable, then wrap the grip twice or use lighter string. If you want your racket to be heavier, change your grip into the lighter one so that the head will be heavier. To check whether your adjustment is already correct, just do the balance point test with your finger. Regarding with stiffness, there are two type of racket, flexible racket and stiff racket. Flexible racket is more flexible than stiff racket to play any stroke. One thing you have to keep in mind that it is not adjustable as the weight and balance point. So it’s very important to check the stiffness when you buy a badminton racket. How to check it? There’s no other way but try to bend the racket gently and carefully. Remember, just a little bend especially when you are in shop. However, a racket shaft, like all other equipment, will ‘season’ which means that over time it will become less stiff to a certain extent. At a glance, the difference between those kind of badminton rackets is on momentum yielded. Momentum determines shuttlecock speed and power when it’s hit while momentum is determined by swing speed. Faster swing will produce greater momentum. For flexible racket, momentum is obtained from swing speed momentum plus the flexibility momentum while stiff racket momentum comes from 100% swing speed. 1. Hold your racket on its handle and racket head. 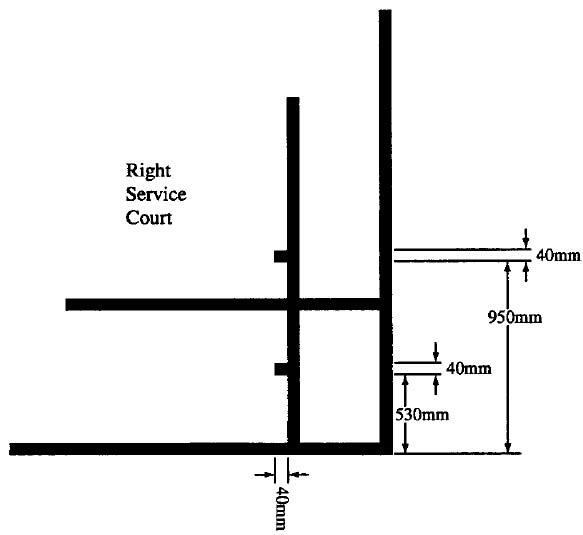 If the racket head does not twist then this racket is perfect for placing shuttlecock because with fix head, the direction of your shuttlecock will be more precise. 1. This racket type gives a good repulsion when you swing it. Why? Because when you swing it, the shaft will bend a bit to the back. So at the time a shuttlecock hits your racket, you don’t need extra strength to produce power in your stroke. 2. Because of its flexibility, you will find it slightly difficult to do accurate shot placement. As the shuttle lands on the string bed of the racket, repulsion will cause the head of the racket to vibrate and leading to uncertainty of shuttlecock flight direction. This vibration makes you little bit hard to control shuttlecock. 3. This badminton racket is suitable for defensive and stroke player. This kind of player styles often play long clear shot (lob) and drop shot. They rarely play smash shot. They smash only when they get clear chance. Since using this racket needs less energy, player don’t need to worry to spend much energy on their strokes so that they can focus on defense. 4. Flexible racket is very good for defending smash. Such racket only needs a little power to return the shuttle from opponent powerful smash. 5. This racket is the best badminton racket for them who start playing badminton as they don’t need lot of strength in doing powerful badminton shot. Thus, they are able to focus more in improving their skill. 6. Another weakness of using this racket is less speed in returning shots from the opponent. This racket has a little or no repulsion. Shuttlecock will bounce off immediately. With less repulsion, shots are less powerful. This means you need to have extra strength when you do shot with such racket. 1. Stiff racket is best used by player who likes placing shuttlecock. This racket can’t bend so that it won’t produce any vibration. So your hit will be accurate. 2. Stiff racket is also good to do fast attack, deceptive stroke, and netting. Obviously, playing badminton needs speed. Flexible racket will give power but less speed. On contrary, stiff racket gives you speed but requires extra strength. With stiff racket, you need your wrist power and less swing movement. Advance players with good speed and deceptive movement need fast execution from their wrist. Lots of world player use this racket because they have both speed and power. Hence, stiff racket is suitable for intermediate and advance players who have already mastered in basic skills and strokes. 3. The weakness of this type of racket is that you need strong swing or fast action with your wrist. Players who use stiff racket must have good technique as well as good control of power to make speed. Another thing you should consider when looking for a badminton racket is frame shape. 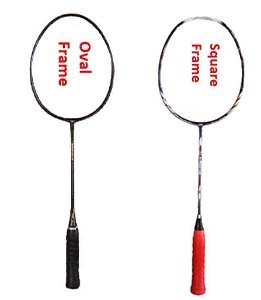 There are 2 kind of racket based on the frame shape, i.e. oval (conventional) shape racket or squarish (isometric) shape racket. The only difference between an isometric and conventional frame is the sweet spot which the isometric has larger sweet spot. Sweet spot is a specific area on the string bed of the racket, that usually the center of the string bed, where shuttlecock will be hit excellently. On the other hand, conventional frame has smaller sweet spot but when shuttlecock hits on the spot, it will create a perfect shot as well. However, this frame is not common on the market now since most people prefer isometric shaped rackets. You will find various badminton shuttlecock brand in the market. One of them is Yonex, a very famous but also expensive brand in the world. Anyway, badminton shuttlecock has common specification should be complied. We’ll talk about it later. There are two kind of shuttlecock according to its raw material : feather and synthetic shuttlecock or plastic. Each type has different characteristics. Obviously the synthetic type is more durable rather than the feather but offers lower quality flight and stability. Its speed is much lower than feather on initial impact but slow down less towards the end of its flight. On contrary, the speed of feather shuttlecock can reach 320 km/h and slow down faster as they drop. I think the characteristic makes the plastic is never used in international tournament. The weight is around 4.74 – 5.50 Gram and its length can be between 62 mm and 70 mm. The cork diameter is 25 – 28 mm while the diameter of that the feathers make is around 54 mm. The number of feathers is 16 where each feather has length 70 mm. The badminton shuttlecock is usually graded based upon its speed (range from 75 to 79). In order to understand what shuttlecock speed is, we should see how far a shuttlecock can reach when it’s hit with a certain power. A shuttlecock is categorized faster if it can reach further distance (further means faster). However, the speed is influenced by temperature, altitude and humidity so that the similar shuttlecock could have different speeds in different places. So, it won’t be surprised if a badminton shuttlecock flies perfectly in Beijing does not have similar performance in Jakarta. But of course, high quality shuttlecocks are more durable, have better flight stability, and have a better trajectory, as well. Regarding with temperature, shuttlecock speed will be faster in hot weather rather than in cold weather. About altitude, the shuttlecock will also be faster in higher ground compared with in lower ground. There is a 30 cm distance between each speed. Therefore, when hit by a relatively same power, a shuttlecock with speed 76 will go 30 cm farther than a shuttle with speed 75. These different speed are useful to be used in different part of the world. In China shuttlecocks with speed 76 are used in summer and speed 77 in fall. Shuttles with speed 75 are perfect in Thailand, while speed 76 and 77 are perfect in Indonesia, Singapore, Hong Kong and Malaysia. Speed 77 and 78 are used in America. Speed 78 and 79 are used in Finland, Canada, Korea and Japan. Shuttles with speed 79 and 80 in Australia in winter. Speed 73 and 74 are only used at highland such as Yunnan province at China and Colorado Spring at America or Johannes Burg, South Africa. However, the above recommendation is merely a guide. You have to choose the shuttle speed that suits your needs. Just for your info, Badminton World Federation (BWF) issues certification for some badminton equipments including shuttlecock in a certain period. When approval is granted to a manufacture, it will be entitled to include the approval statement “Approved by the BWF for international play” on the packaging for that certified brand and grade of Approved bythe BWF for international play. If you have no problem in budget and very serious in badminton, as well, you should try the certified badminton shuttlecock.